Encourage coordination between public instruments across land-use sectors. 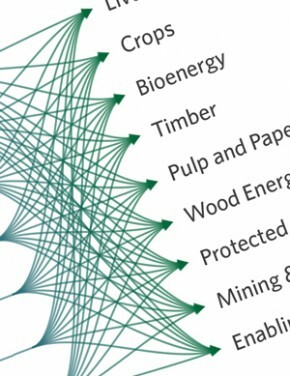 The tools cover national and international, public and private finance, across a full range of land-use activities. The Landscape of Land Use Finance tool provides a snapshot of public and private land use finance going to green and potentially BAU activities. It can help countries and development partners to understand how much and what type of finance is flowing, among which key actors, and to which activities. It helps by identifying channels, gaps, and blockages in the flow of finance. Governments could track public or private expenditures / investments as a first step to obtain an initial overview of core land-use financial flows, rather than comprehensively including all flows. As capacity and data availability increases, they could expand the scope to include all actors to enable a more detailed understanding of how different sources of finance interact. This analysis can also inform the design of multi-sectoral strategies to address climate-compatible development challenges (such as REDD+ programs). The diagram below shows a typical landscape of land use finance landscape diagram (known as a Sankey) where the width of flows represents the volume of finance flowing. The Financial Viability-Gap Analysis tool explores whether climate change mitigation and adaptation activities are viable from a financial perspective. Some green land use activities are more expensive than BAU ones, resulting in a viability gap. Here activities need to be publically funded or supported. Other green land use activities are not intrinsically more expensive but face risks or information gaps that can increase costs and discourage investors. Here public financial instruments can help overcome those barriers. Improving the enabling environment – by e.g. legal / regulatory standards, land allocation and management systems, certification standards, and implementation of monitoring and enforcement systems. The financial viability gap analysis tool can be carried out as part of a detailed sectoral assessment or at the activity level. The public finance mapping tool provides a framework to track key public financial instruments for climate change mitigation and adaptation in any given country, jurisdiction or sector. It can identify whether instruments target BAU or green land-use activities. This tool enables governments to assess whether their overarching financial policies and instruments, including those supported by development partners, are coherent, and consistent and to what extent they provide support for green production. This tool can provide insights to enable greater coordination across sectors, technologies and geographies, among governments and donors, by identifying entry points for donors to deliver finance in ways that maximize domestic and private sources of investment. As a first step, governments could focus on mapping incentives for BAU and green activities. In time it could also be useful to map disincentives arising from, for example, taxes and fees imposed upon land use activities. Land use encompasses a diverse and crosscutting range of political, economic, environmental and social interests. Getting the right combination of policies and financial instruments in place to unlock green investment at scale is politically challenging and often subject to long-standing vested interests. Improving the ability of governments to assess empirically how finance is flowing across land-use sectors, which viability, cost and risk gaps need to be addressed, and whether public or domestic instruments are helpful and coherent, is essential. Success will also depend on whether governments have the capacity to define, test, and verify, green activities in ways that delivers developmental and environmental outcomes. The frameworks, approaches and tools presented in the paper seek above all to help lower and middle-income countries and their development partners to identify opportunities to work together with businesses and to jointly finance green land-use transitions. Climate Focus and Climate Policy Initiative are now actively engaging country partners interested in testing some of these approaches with the aim to publish case studies, initially for two countries, within the next year. Exploring the co-benefits of adaptation and mitigation. Barriers, incentives and benefits in the adoption of climate-smart agriculture. Lessons from the MICCA pilot project in Kenya. This project focused on the key role professionals play as change agents in climate action, and what is needed for all sectors to advance uptake of low carbon reslience based practices. This Sourcebook provides a wide range of knowledge and expertise to support actors to make the agricultural sectors (crops, livestock, fisheries and forestry) more sustainable and productive. This is a GIZ discussion paper prepared for UNFCCC COP24 in Katowice, summarising early findings from research on the potential of mitigation–adaptation linkages in long-term climate strategies. This paper examines innovative approaches that have been adopted in four BRACED projects to build resilience to current and future climate risks.